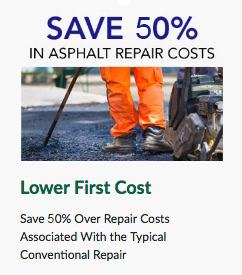 Asphalt, is a term commonly used but highly misunderstood. An appropriate explanation refers to asphalt as a highly viscous pitch-black semi-solid substance that is sticky and is a form of petroleum. This makes it naturally occurring. Why is asphalt, therefore, very famous and why is its recycling such a touchy subject? This particular subject will be discussed at length in this particular article. Why should I use an asphalt recycling machine? Asphalt and aggregates are most often recycled for better performance and use. It is during reconstruction, resurfacing and removal of asphalt pavements, as well as unearthing of buried utilities, that this particular asphalt and aggregates are gathered. This particular materials are referred to as RAP’s (Reclaimed Asphalt Pavement). It is after proper crushing and screening that the RAP’s almost magically convert to aggregated and high quality plus coated asphalt cement. The whole process of removing the asphalt pavement is pretty simplified but needs a lot of skill and precision. The pavements can be removed either wholly or partially according to the level of wear and tear. When partially removed, the asphalt pavements are milled.’ This is a process where the surface of the pavement is removed by a milling machine. This particular machine can remove almost 50 milometers in just one pass. The operator of the machine thus mills according to the level desired. When the asphalt pavement is to be wholly removed, a bulldozer, or a rhino horn, is used to break out the whole pavement by ripping it. After the materials are thus removed, they are loaded into trucks and taken to the asphalt recycling plant for processing. It is at the plant that several processes occur to change this particular waste materials to recycled asphalt materials. Operations such as crushing, conveying, refining, screening and stacking. The asphalt recycling machine carries out all this processes following a procedure and completely giving out well-refined asphalt blocks. This blocks are recycled through a series of melting and reshaping of the aggregates and asphalt. The blocks are also purified by the Asphalt Recycling Machine to ensure all and any impurities within the original material is properly sifted and removed. It is also possible that after milling, while at site, this asphalt blocks can be recycled. After milling, this pavements are pulverized at site. A machine referred to as the pulverizing machine (which is self-propelled) is responsible for pulverizing half complete asphalt blocks to granular and stabilized base courses. 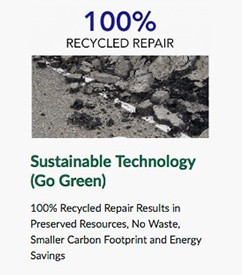 The asphalt recycling machine that is on site also uses the hot-in-place technique, as well as cold-in-place technique where after the pavements are partially milled, the residual asphalt is mixed with reclaimed materials and useful additives which are well-churned. When well-pressed and compacted, this particular asphalt pavement appears as a compact asphalt block that has been replaced rather that recycled. Statistics reveal that asphalt recycling is very famous in many countries of the world currently. It is therefore a very important factor to consider that recycling of this product is unavoidable and the next big business. Instead of filling the world with non-biodegradable asphalt, why don’t we recycle it? 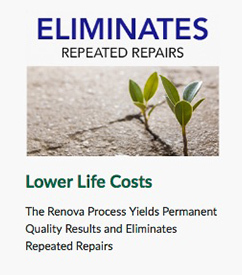 Using the RENOVA, you can recycle the asphalt on location and make it better than new.